White willow can be used to help break a low grade fever, and to relieve the body aches that accompany colds. According to Dr. Duke, a daily cup or two of willow bark tea would probably provide the equivalent of the low aspirin dose recommended for heart attack prevention. One very good thing about willow bark tea is that it is easy on the stomach, unlike aspirin. 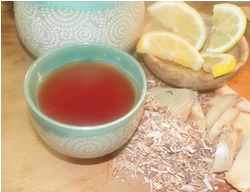 Recipe Instructions: Decoction : Use the chopped bark, not the powdered bark to make your tea. (The powder tends to leave a gritty residue in the tea.) Add ginger to enhance the flavor and help activate the willow bark.